The surreal world continues. 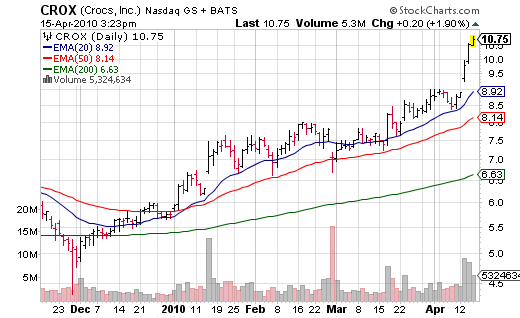 Much like Ambac (ABK) a few days ago, we are seeing stocks lift from the (near) dead. The Greenspan Put Bernanke Forcefield protects all. After trending up nicely since December 09, an analyst upgrade Monday obliterated any shorts who dared bet against the holey shoes. It has been remarkable to see analyst upgrades move stocks of all varieties in such strong manner – harkens to 1999. Anyhow, it appears we’ve time traveled back to 2007. All is good in the world as Americans use their homes to buy anything that moves… and holey shoes are hot again. (full disclosure – i was long Crocs in 2007!) 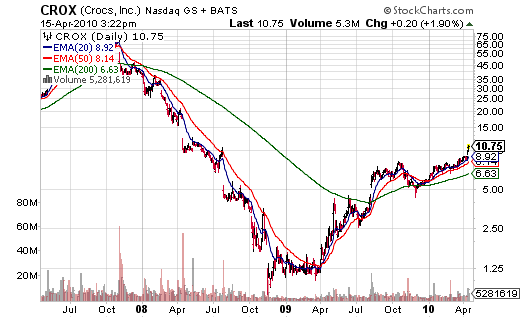 Looking at their analyst estimates, it appears 4 of these folks believe Crocs (CROX) can make about 29 cents in 2010. Which puts it at well over 30x estimates, which is now “cheap” versus a typical retail stock. (new paradigm market) Boo yah – valuation is so 2005. Crocs has high hopes for a comeback. Three inches high, in fact. A new line of strappy red high heels, casual leather loafers and peep-toe sling backs is part of an ambitious bid for a company that grew quickly but tripped when the fad for its quirky clogs faded and knockoffs stole sales. Crocs, which have sold more than 120 million pairs since their 2002 introduction, are certainly polarizing. Anti-Crocs blogs and Facebook groups abound. Plenty of people felt love for the brand when the shoes were introduced in 2002. Revenue reached $355 million in 2006, the year the company went public. A year later, that figure had more than doubled to $847.4 million. The clogs were everywhere. But by 2009, sales had fallen nearly a quarter to $645.8 million. The company cut marketing spending, too, to $4.4 million from $12.7 million in 2008, according to research firm Kantar Media. The sales falloff hurt even more because the company had invested so much in its rapid manufacturing and sales expansion, particularly overseas. But Crocs says cost cuts have it on more solid footing. New CEO John McCarvel took over last month. Crocs, based in Niwot, Colo., feels strongly it needs more styles so it can cater to more tastes and sell more shoes. With the new spring and summer collections there are 120 styles now, ranging from ballerina flats for women to trail shoes for men. Hmmm…. high heeled Crocs. You live long enough, and you start seeing things you’d never imagine.